A couple of weeks ago, something unpleasant happened at breakfast: I peeled a banana, and it turned out to be under-ripe. The skin was almost too tough to peel, and the fruit inside was hard – I knew it would taste terrible if I tried to eat it. So I thought to myself, "This won't do. Maybe I should throw this banana away, but I don't like to waste food. I know – I'll wrap it in plastic and put it in the fridge – maybe that will preserve it until it becomes ripe." So I left it in there for a while, but it didn't ripen in the way I wanted. You know how bananas are – a fridge doesn't help them. The problem became, then, how to dispose of this banana. I don't have a food-scraps bin in my kitchen – normally I just stuff the banana skins and potato peelings into a plastic bottle, and then throw the bottle away when it gets full. But the banana was too big to go in a bottle. "I know," I thought. "I'll throw the banana out the window. No, on second thoughts, I'd better not. It's all concrete out there. It's not like in my previous flat where I was living on the second level and I had a window which overlooked bare earth. My neighbours would know where it came from." Then I had a good idea. I took the banana out of the fridge and put it in my bag, being careful not to place it in a squashable position. Then I picked up the bag and walked to the Northern Melbourne Institute of Technical and Further Education which was about seventeen minutes walk away. I go there every week day because I'm doing a course in Music Performance and Composition – it's a good thing that I moved into this area just before the beginning of the course, because it means I don't have to travel very far to attend classes. The Institute is located next to a river and it's surrounded by parkland. There is a path which runs down to the far end of the campus where the landscape is natural and uncultivated – this is one of my favourite places. I like to go there between classes so that I can get away from all the stress of being around people. It's very peaceful and deserted, but if you look down at the side of the path you can always see thousands of tiny ants crawling along in a line, busily going about their ant business. The ants, in fact, were the reason I came here: I wanted to give the banana to them. So I unwrapped the plastic and laid the fruit down on the ant-line, with the peel half-open in what I hoped was an appetizing presentation. The ants were a little confused at first – they were just trying to follow a trail and they had to find a way around this new obstacle. Some of them crawled over the banana and inspected it, but they didn't seem very interested. I thought maybe it was too cold for them because it had just come out of the fridge. They didn't swarm over it like I expected them to. I watched the ant-scene for a while, then I went to my educational class. I've been very busy lately, studying full time – the course I'm doing is all about music. This is a course for people who love playing music and want to make it their whole life. There are about twenty-three people in the class, and every one of them is skilled in playing one instrument or another. They're very nice. We learn about how to play jazz and contemporary music better, and all about music theory and technical subjects, and sometimes we get out our instruments and put on performances for the class. A couple of weeks ago, I performed with a band-group and we played a couple of old jazz standards called "Exactly Like You" and "Choo Choo Ch' Boogie". The audience liked it – all the students and teachers clapped at the end (and during). I'm a little concerned about a performance that will happen on May 7th – I'm going to play a song called "There's a Kind Of Hush" and a couple of others along with two or three other students, in accordance with my piano teacher's instructions. It would be stressful enough if I just had to learn the songs myself and play them on the piano, because standards are high and a lot of practice is needed. But the added stress of having to ask other musicians to help me out and organize rehearsals with them, well that makes me worried. I'm not afraid of failure, but I'm very much afraid of human contact. It's been a few weeks since I've seen my friend Cat – I called her to ask "Where's a good bicycle shop?" 'cause I was going to buy a bicycle, and she told me where she got hers, giving it a positive recommendation. She also said, "After you buy a bike there, ride it over here so that I can see it." So I said, "Okay." But it's been fifteen days since I bought my new bicycle and I still haven't shown it to her. Maybe I will soon. Cat likes me but she doesn't always want me to come over – like, on March 18th I was going to go over to her house to watch a movie because she invited me, but she cancelled the invitation at the last minute because she wasn't in the mood. So I can't just show up any time. Geographically, I live much closer to Cat than I used to last year and it would only take about ten minutes to ride to her house on a bicycle. Maybe I should call her right now. I just called her and the phone was engaged. I had to turn off the computer first because lately the phone has been interacting with the computer in surprising ways. Like, when I hang up the phone, while the computer is switched off, it switches back on. And sometimes if the phone rings while the computer is on, when I pick it up, there's no one there. I don't know if that's a technical fault or just some nuisance caller, but I'd rather not risk calling someone while the computer is turned on, until I've done some more testing. 'Cause maybe they would pick up at the other end and I wouldn't be able to hear them. All this is a result of me getting a new motherboard for my computer. I wanted to install a Fire-wire card but there weren't enough slots in the computer circuit board so I had to upgrade the whole thing and that meant the operating system had to be re-installed. So in the past few days I've been re-loading my data from back-ups and re-installing software and making little tweaks to the computer settings just as if it were a new computer. And why did I want a new Fire-wire card, you ask? Because I've bought a new kind of mp3 player which requires a Fire-wire connection. This particular mp3 player can hold more than 5000 songs, at least that's what it says on the box. And it looks so cool with its white plastic and chrome finish. So even though I had to rearrange the whole computer to accommodate it, I think it's worth it. I've been spending up big on new possessions in the past week. On the same day that I bought the mp3 player, I also bought a little electronic metronome. It goes "beep, bip, bip, bip" to keep a steady tempo in the music. I've already found it very useful – yesterday I was working on this song I'm writing which has variable tempo, and I sang it along with the metronome and adjusted the tempo so that sounded right, and then I wrote the beats-per-minute numbers beside the lyrics on the lyric-sheet and that will make it easier when I'm sequencing it. Writing my own music is the task that I'm mostly focused on at the moment. Up here, in my head, the songs are already written and I know exactly how they're going to go – I just need to express them. In the past three months while I've been walking back and forth to school and other places, I've been writing new lyrics in my head. And then I write the lyrics down. While the other students are hanging out and talking to eachother in the playground, I'm pacing back and forth going through melodies and chord sequences in my head trying to refine the arrangements that I've thought up. I think my new album will be my best work yet – but there is a lot of work still to be done. The other day, a very unfamiliar sound rang through my home – it was the doorbell. I opened the door and there was a man outside. He said, "I'm collecting for the Red Cross. Will you make a donation?" So I said "Okay," and I gave him six dollars. The man went away. A few minutes later, the doorbell rang again. This time, it was a girl standing outside. She said, "Excuse me – I used to live in this flat. I was wondering if you have been getting any mail for me, and if so, could I collect it?" "Yes, I have been getting mail for you. But I'm afraid I've been returning it to the senders. Sorry." The girl looked disappointed and she went away. Afterwards, I realised I should have asked her if she had the key to the padlock on the mail box outside – it's been locked since I moved in here and I can't get it open, so that's been very inconvenient. Maybe she had the key, but now I'll never know. The next day, I decided to do something about this locked mail box issue. 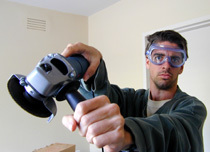 I picked up a special kind of power-tool called an "angle grinder" and plugged it in to a long extension cord. The tool had a special circular blade on it which is designed for cutting metal. Then I put on some safety goggles, and even though it was a hot day I put on a jumper with long enough sleeves that they could partly cover my hands in a protective way. I went out to the mail box with the tool in my hands, and turned it on. As soon as the spinning blade touched the metal padlock, it set off a shower of sparks and made a loud grinding noise. Five seconds later, there was a smell of burnt metal in the air and the bolt of the padlock was cut cleanly through. So after that I was able to open the mail box without any trouble. I went back to look at the banana a few days later, in fact I looked at it almost every day for two weeks – the ants became more interested in in after it became a little bit moldy and rotten. Before long they were digging holes in it like miners, and they carried bits of it away to their nest. There were a lot of other insects interested in it too – beetles and grasshoppers were crawling over it and I think they were eating it. After about two weeks it was just a dried out black skin with nothing left in the middle except dirt and gumnuts. And I thought to myself, "This is how it works in nature – the process of organic decomposition." There are plenty of insects around this area – a couple of months ago, one crawled into my flat and I took some photos of her. She saw the camera and she was a bit shy at first so she tried to run away, as if to say, "Don't take my photo – I'm ugly! Why would you want to take a photo of me?" So I explained that I wanted a photo of an insect so that I could do a painting, and the painting would feature a large insect standing next to some small people. The model was still reluctant, but eventually she agreed to stand still for a few seconds while I took some photos with my camera set to "close-up". Then I picked up a rock and smashed her brains out, spilling her insect blood like so much banana juice. And that was the end of that. There are no good record shops in this area. Last year I used to go to a second-hand record shop every week and that meant I'd often be buying new music. But I don't have time to do that now. The only CD album I've bought this year has been "_Underscore" by Music Vs Physics, and I already had most of that recording on vinyl. I bought an EP by Laura Imbruglia, who I saw performing live for the second time on March 19th, and she is a songwriting genius. I haven't yet listened to the EP though. I bought a CD single called "Still Real" by george, when I went to their gig at the Forum on February 20th – that was quite an awesome experience. They've still got it. But basically, my plan for this year is to buy hardly any music and go to hardly any shows, that way I won't be disappointed. At the moment I'm reading a book called "The Many-Coloured Land" by Julian May (1981). It's a science-fiction-fantasy book about these people who find a way to go back in time six million years. So they go, with the hope that they'll form a new simple kind of society in the ancient world. But when they get there, they are surprised to find a race of aliens living on earth, and quite a bit of conflict ensues. What no one has mentioned yet is that maybe the whole human race is descended from the offspring of the aliens and time-travellers who can breed together, so I think that's what they're leading up to. This book is written by a person who knows lots of long words that I've never heard before. The program Posh Nosh is almost like a cooking program, but if you watch closely you realise that it's actually just a pretend satire of a cooking program and it's very funny. It's making fun of upper-class people with their pretentious ways. There are lots of jokes about the way they're so picky about how food is prepared. In the last episode I saw, this guy was trying to decide where to put the slice of lemon on a plate that had fish on it, and he spent ages just moving the lemon about from place to place trying to get it perfect, and finally he solved the problem by getting rid of the fish altogether. I laughed so hard, I almost died.